Nonprofits enjoy privileges not available to other organizations. But these privileges come at a price: Nonprofits must comply with special IRS rules and regulations to maintain their tax-exempt status. Whether you are just starting your nonprofit or are well established, you’ll find all the information you need to avoid the most common issues nonprofits run into with the IRS. Do You Need an Independent Audit? What Can a Donor Contribute? When Is a Contribution Made for Tax Purposes? Your nonprofit’s relationship with the IRS doesn’t end when you receive your tax-exempt status. Indeed, that’s only the beginning. The IRS will continue to oversee its compliance with the myriad of complex tax laws and regulations governing nonprofits. Dealing with the IRS and its rules is the price all nonprofits pay in return for the substantial tax benefits they receive. Failure to comply with these laws can lead to dire consequences—revocation of your tax-exempt status, or the imposition of taxes and penalties on your nonprofit, or even on your officers, directors, or employees personally. In the past, the IRS was relatively lax about monitoring and enforcing nonprofit compliance with tax rules. However, in response to widespread publicity about abuses by nonprofits and Congressional calls for better enforcement, the IRS has begun to more closely monitor nonprofits. These include more audits, requiring all nonprofits to file annual notices with the IRS, and substantially beefing up the annual information return filed by larger nonprofits—the IRS Form 990. Nonprofits need to take ongoing compliance with IRS rules and regulations more seriously than ever before. how to steer clear of the prohibition on political activity. Running a nonprofit is difficult enough these days without having to worry about the IRS looking over your shoulder. Turn to this book whenever you have a question about IRS rules or nonprofit compliance issues. What this book is not. This book is not about how to form a nonprofit corporation or apply for IRS recognition of your nonprofit’s tax-exempt status. For guidance on these tasks, refer to How to Form a Nonprofit Corporation, by Anthony Mancuso (Nolo). This book has been written primarily for Section 501(c)(3) organizations that qualify as public charities and it does not cover the special tax rules applicable to private foundations. 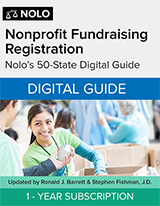 Moreover, while much of the material here is applicable to nonprofits other than Section 501(c)(3) organizations, this book has not been written with such organizations in mind. Don’t miss this book! by WILLIAM H.
Quality control - printing by Sheryl J. Where must the money go? by Alan K.